April is Autism Awareness month. Even if your church has a thriving special needs inclusion ministry, navigating a classroom environment that includes both typically developing children and those with intellectual or developmental disabilities can be tricky. What can we do to make the classroom environment inclusive for all children? Here are a five strategies. (1) Post a visual schedule and clear expectations for behavior. A visual schedule with includes a list of written activities represented in picture form that can be taken out of sight as they are completed. Children can be given ten, five, and two-minute warnings before each activity changes, especially when the transition in schedule involves leaving the classroom. These cues along with the simple verbal cue, “What’s next?” can be used to signal that it is time to look at the schedule and transition to the next activity. 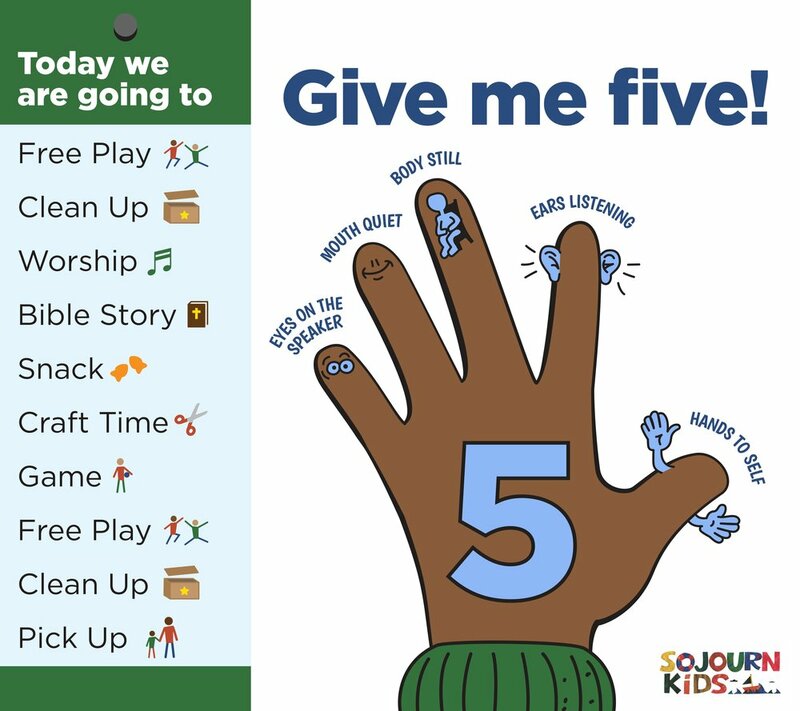 Visual behavioral expectations such as the “Give Me Five” strategy in the illustration above can also be used to gain the children’s attention. Our leaders say, “Give me five!” and hold out their five fingers. The children should respond by listing expectations with exact wording from the board. (2) Structuring your classroom environment for success. 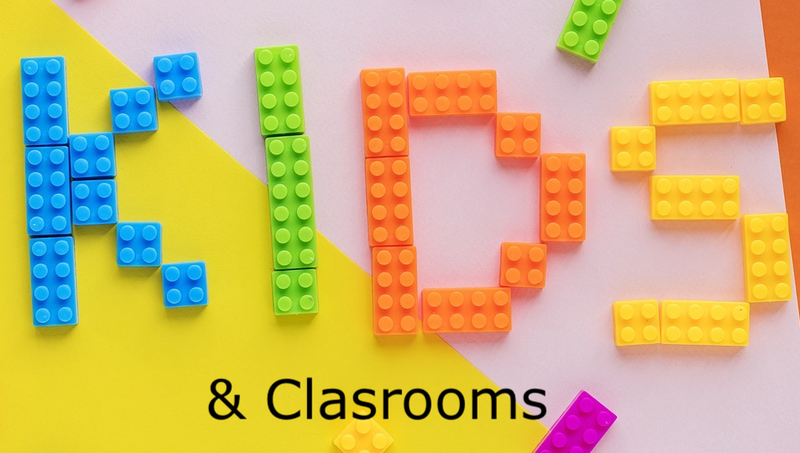 It is helpful for classroom teachers to make sure there are hands on materials for the lessons and that the toys in the room are organized and appropriate for indoor play. Sometimes the environment can be adapted in ways that help all kids focus. In preschool classes, for example, sheets can be used to cover toys during lessons or you can use a rug or corner to identify a visual area for circle time. It can also be helpful to use a wiggle seat for kids who have trouble sitting still or a visual time timer for kids who need a little extra help with the schedule prompts. (3) Give the kids direction by communicating the “what” and “why.” It is better to say, “It’s time to go to worship, because we love to sing to Jesus together” than to ask, “Do you want to go to worship?” It’s helpful to avoid implying that there is a choice when there is not, as this could set the child up for confusion and possibly a power struggle. (4) Connect to redirect. 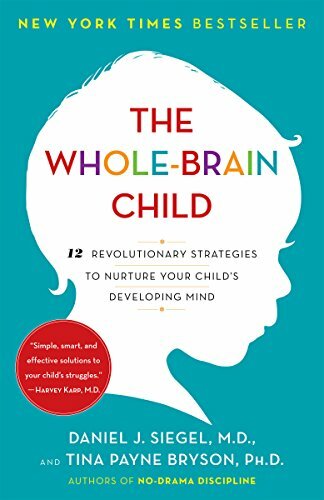 This strategy is adapted from The Whole Brain Child by Daniel J. Siegel and Tina Payne Bryson. They encourage parents and teachers to engage with children as a way of earning their rapport before redirecting their behavior. This strategy is particularly important for kids who have experienced trauma and associate authoritative commands with danger. Utilizing strategies like these can help your classroom to be inclusive for all children. Try them out and be a part of helping your local church fling wide its doors for people of all abilities.